Still rockin’ a Nintendo Gameboy of some kind? Well, Sony wants you to ditch your outdated Game Boy (though we find that debatable) and hop on its latest handheld, the PlayStation Vita  … when it eventually hits America. Sony Computer Entertainment America is apparently a proud partner with UC Berkeley  and rumor has it events are coming to spread awareness about the Playstation Vita. 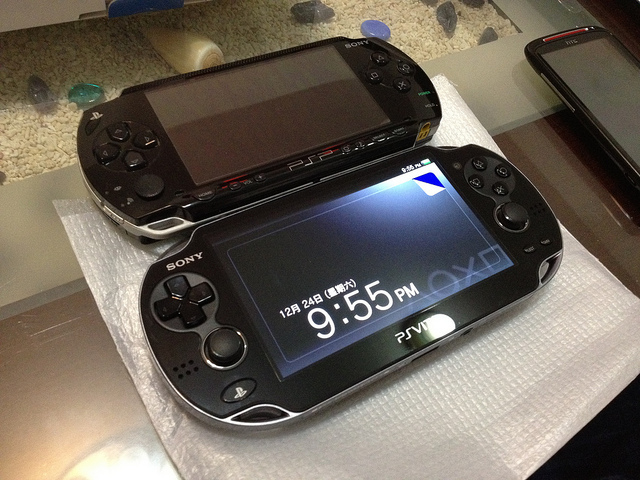 Rumor as in, the Vita is Sony’s next big thing and it’s kind of failing in Japan . True, by the time the Vita does hit the States, Sony will have had time to work out some alleged crucial glitches and errors that plagued the Vita’s debut  in Japan, which they still deny. New electronics do tend to have more glitches on launch date (just look at the iPhone 4 ). What we’re worried about is the fact that the Vita is just another shiny, new toy amongst the many others that are already out there. Will Cal students even have time (and money) to invest in another plaything? Couple that with expensive memory options , Sony might not receive the kind of success they were expecting. Unless, of course, any events to raise awareness hand out free PlayStation Vitas.